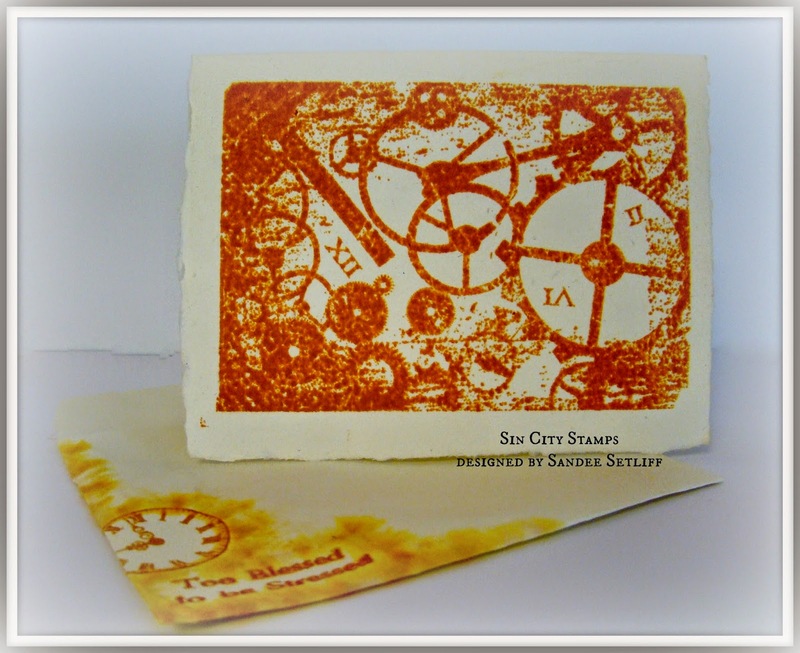 Hi everyone, Sandee here with a easy peasy grunge card using the TIME Rubber Plate stamp set. Because, as the sentiment states I am..."too blessed to be stressed" ...and sometimes you need to be able to whip out a card quickly and easily without any stress! The base paper for my card is made using my Arnold Grummer Papermill kit which in itself, with it's soft deckled edges gives you a wonderful distressed feel. I used Ranger's Wild Honey Distress Ink to stamp the large background stamp that comes in the set to create the front of my card. With all the detail in this stamp you don't need to add anything else to it. When I send a card in the mail I really like to add something extra to the front of the card to make it special. I used the same supplies, keeping it simple was my motto today! After stamping the sentiment and the clock slightly offset I used my Koi water brush to spread out the Wild Honey color to give the envelope an aged look. So there you have it, one great stamp set = one fast and easy card to make! Love to see the gears. A awesomeness card Sandee. Thank you Sharon, and thank you for visiting! Love it. That envelope is awesome! Sandee, so fab and loving it.WTG!!!!! Love your color combination and the stampset. Great project. Wonderful card. So simple but so very cool. Beautiful! I love the style.